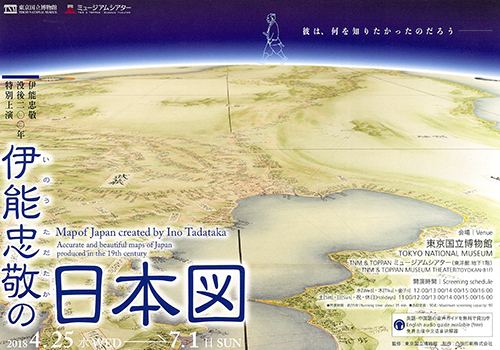 TOKYO NATIONAL MUSEUM - Events TNM & TOPPAN MUSEUM THEATER Past TNM & TOPPAN MUSEUM THEATER VR program ”Map of Japan created by Ino Tadataka"
>> VR program ”Map of Japan created by Ino Tadataka"
VR program ”Map of Japan created by Ino Tadataka"
In the Edo period, Tadataka Ino surveyed Japan over a period of 17 years from the age of 56, and for the first time completed a map of Japan that had been made by taking actual measurements. In order to accurately measure distances, it is said that he trained himself to always walk with the same stride. The map he produced was so refined that it compares favorably to current satellite photos. Furthermore, he drew his map beautifully like a painting, describing details down to the terrain of the mountains and coastline and the landscape of the highways. How did Tadataka and his team create this elaborate map? We will use virtual reality to uncover the mystery that surrounds Tadataka Ino’s map of Japan, examining a wide range of aspects from the features of his work to his actual surveying method. *Admission starts 5minites prior to screening. You may not enter mid-way through the program. *Admission at the front entrance ticket counter ends 15 minutes prior to screening. Admission at the front of the theater ends at screening time.